Several of us watched Greg Palast's new film, The Best Democracy Money Can Buy: A Tale of Billionaires and Ballot Bandits. This is a great film. A must see. It will make you angry but it will also inspire you to fight for democracy, especially for the rights of the poor and people of color. 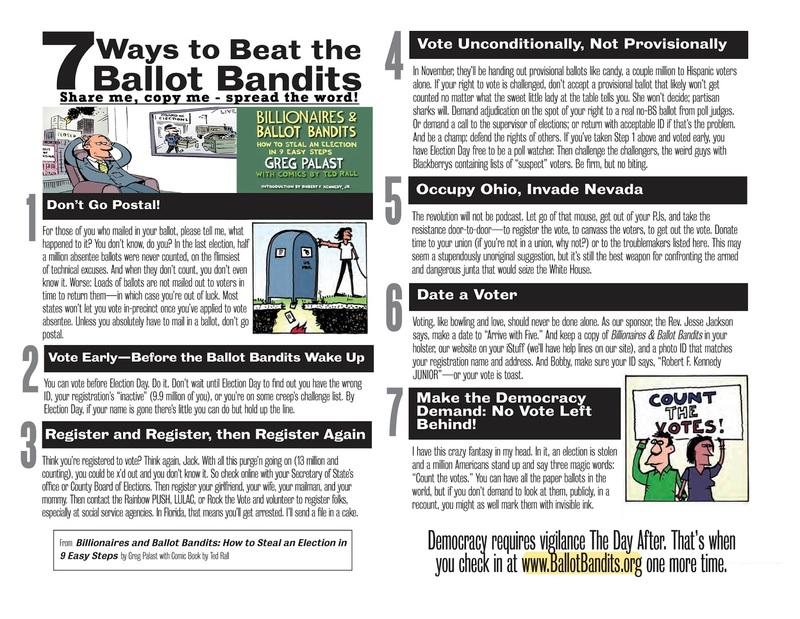 Voter repression and voter suppression is a reality and Palast lays it out for us. Here is an article he wrote about it for the Rolling Stone. We learn about caging, purging, and what he calls the death star, interstate crosscheck. All of these methods are removing people from the voter rolls or not counting their votes when cast. It is ugly. It's illegal. It's nasty and according to Palast, it is why Bush "won" twice. It is happening now. See this film and show this film (we chose the $50 license fee option) wherever you can before next Tuesday. Get active. 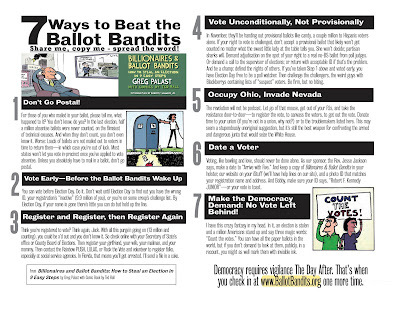 Here are Palast's seven ways to beat the ballot bandits.